I can't remember where I first heard about the Body Mind Float Center. I think I was running down Park Ave one day, saw the sign and thought it sounded just weird enough to try. I sort of forgot about it for a while, then for some reason I signed up for a 50K. And I thought maybe it would feel good to float around after a long run, so I made an appointment. I chose the Tranquility Float Pod because I liked the name and because it looked like a space pod. Or a futuristic coffin. But I'm going with space pod. It's filled with about 10 inches of Epsom salt water that keeps your body afloat, like being in the Dead Sea. Flotation therapy can supposedly offer relief from muscle and joint pain, stress, addictions, sleep disorders, migraines and even PTSD. I was primarily interested in the athletic recovery aspects. According to the Float Center's website, "Research has shown that Floatation Therapy decreases cortisol levels and increases the production of endorphins, the body's natural pain killers. 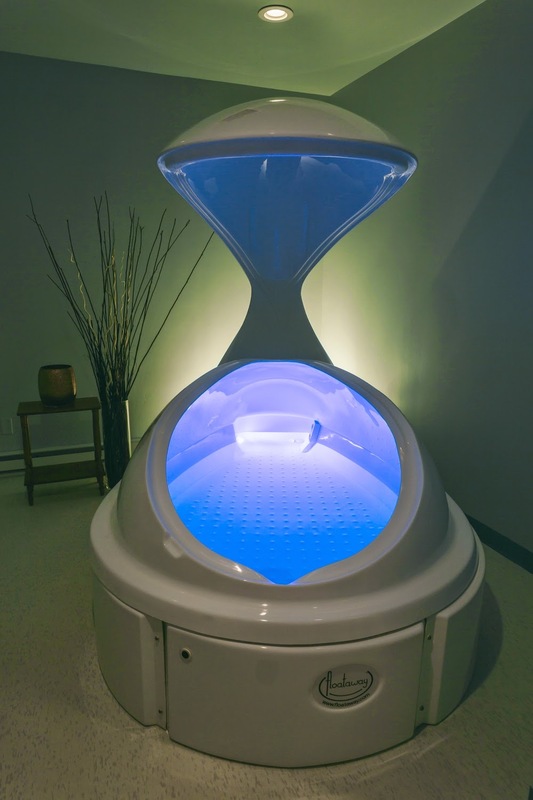 Total relaxation promotes blood circulation and muscle growth. The Epsom salt solution reduces lactic acid build-up, maximizing the benefits of your workout. The rate of your recovery is greatly accelerated." When I walked into the float center, I wasn't really sure what to expect, but the staff dude took me to the float room and explained what to do. There was a shower in the room to rinse off before and after the float. I got into the pod, lowered the lid, turned off the light inside the pod (the room lights had a motion sensor and turned off after 5 minutes) and started my float. First I put my arms at my side but I felt too much like a corpse in that position so I moved my hands behind my head, like in a sit up position. Then I felt like I was just hanging out being all weightless, floating around in outer space. There were ear plugs in the room that you can use if you want, so I had put those in, and with the lights out, I had the same view whether my eyes were open or closed. It was a weird feeling floating around in silence and darkness and anti-gravity. But it was also kind of relaxing and peaceful. I don't get many moments of total silence and darkness in life. And I get even less moments of being totally suspended in space. The pod was pretty small, but I didn't feel claustrophobic because my body didn't have any contact with anything other than the water. Though if I wanted to I could touch my feet to one end and my outstretched hands to the other, so I don't know how well a tall person would fit inside. Appointments last 90 minutes, but you can get out earlier if you want. I only lasted about an hour before I got cold. (But I'm always cold. A normal person with normal body temperature regulating systems would be fine). On my way out, the staff dude gave me an "I floated today" sticker and said "Enjoy the rest of your float." I was unaware that I was still floating. But my legs, which had been a bit fatigued from my 18ish mile trail run earlier in the day, did feel noticeably lighter and fresher. At $65 a session, I don't think I'll be floating on the regular, but I might use it once in a while to give my tired muscles a break. And there is a float pod that's big enough for two people, which would be great for bring a friend to space day. That's totally a thing, right? Lyric of the moment: "Don't worry, even if things end up a bit too heavy, we'll all float on, alright..."